Apple released latest version iOS 6.0.1 with some new feature and bug fixes. 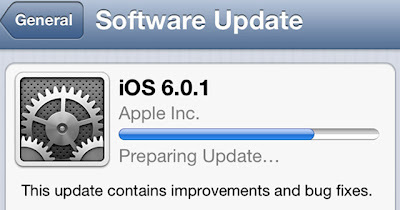 Apple iOS 6.0.1 supports iPhone 5, iPhone 4S, iPhone 4, iPhone 3GS, iPad (3rd generation), iPad 2 and iPod touch (4th generation). If you have iPhone 5 can upgrade over the air. Fixes a Passcode Lock bug which sometimes allowed access to Passbook pass details from lock.